Although many gifted B2B marketers are set apart from their peers by specialist skills and individual abilities, I’d argue that all the most talented share a few essential attributes. Some people are content to take whatever comes their way, do the job they’ve been asked to do and move on to the next task. Great B2B marketers, impelled by a natural curiosity, approach things differently. Rather than blindly box-tick the status quo, they can’t resist posing questions and challenging norms. Asking ‘why?’ and ‘why not?’ helps to anticipate problems, sense-check thinking and nurture a shared understanding of complex issues. By lifting the lid at the right time, they ensure fewer mistakes, better collaboration and rosier outcomes for all. Having a good eye for detail sounds like an obvious quality for any marketer, but the need for acuity goes way beyond being able to spot a double-space typo at twenty paces. Great B2B marketers need powerful observation skills to sense and interpret the behaviours of colleagues, clients and suppliers. As we all know, sometimes the subtlest of signals portend the most serious of outcomes. That’s why the best of the best stay alert and tune their antennae to read between the lines, anticipate and keep things on track. We can’t all be the brightest, fastest-minded ideas-guru in the room, but all the best B2B marketers excel at creative gut-feel. They may not be the most gifted writers, designers or art-directors, but they are blessed with enough creative nous to distinguish a promising concept from a lame duck. They may defer to others for award-winning imagination, but they know instinctively whether the words and images work. They are skilled at shaping and interpreting their colleagues’ thinking, arguing intelligently and channelling consensus. They can take a creative idea, package it and sell it convincingly. Let’s face it, most B2B marketers aren’t in it for the cachet or glamour. After all, you won’t notch-up much street-cred down the local by bragging about the ROI of your latest FinTech campaign. Few B2B brands are household names. Most dwell well below the radar of widespread notoriety and exist far removed from the public gaze. However, whilst they may not be working on the sexiest brand in the world, great B2B marketers still take huge pride in what they do. Yes, they enjoy well-deserved accolades and the occasional gong, but their real motivations are more likely to be rewards like personal achievement, positive results and performing as part of a successful team. Sometimes B2B can be a complicated beast. Technical language, esoteric propositions, multi-dimensional messaging, intricate decision processes and specialised buyer audiences: it can all add up to a painful headache of complexity compared to the relatively easy-going vibe of consumer marketing. The B2B marketer’s challenge is to distil and hone this complication into potent strategies, assets and campaigns. 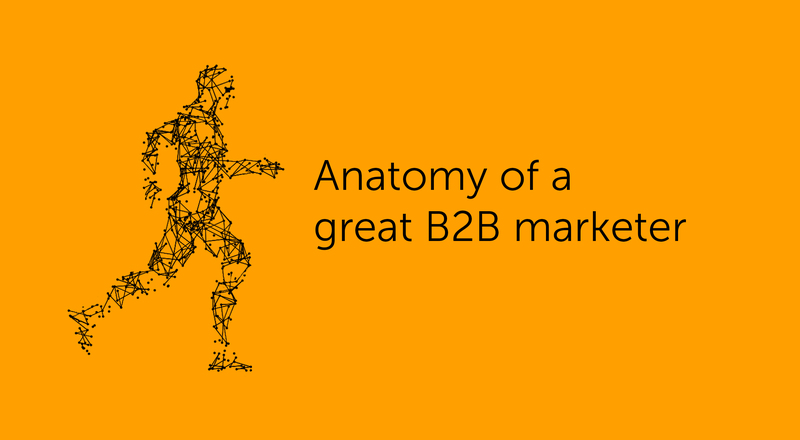 To pull this off, every great B2B marketer is endowed with a well-exercised left-brain to power their incisive thinking, granular analysis and meticulous planning.